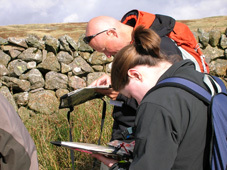 Carol and Richard have been training and assessing Mountain Leader, Lowland Leader and Walking Group Leader candidates for over 10 years. 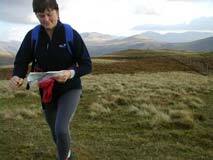 Mountain Marathon / Adventure Race Navigation and Skills Course. 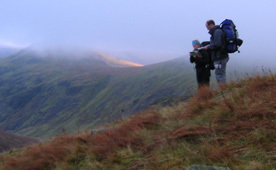 Eskdale YHA. 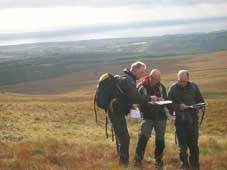 This covers Navigation Skills, Kit and Strategy for all levels and abilities. Course starts Sat. 09.00 - Finish 4.30 Sun. Price £165.00 including food and accomodation. Map : O.S. 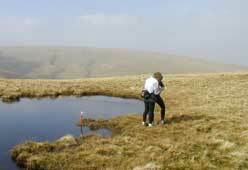 Ordnance Survey 1:25,000, English Lakes South-Western Area OL6. 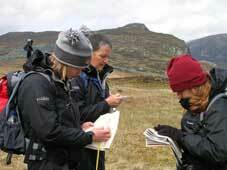 A quick look at the map and you can see that the back garden at Eskdale YHA runs straight out onto the fells. ( this means more training time). The variety of terrain from open fell, mountains and complex contour areas must make it one of best training and competition areas in the U.K.
Little wonder that Mountain Marathons and Adventure Races return time and time again to this tremendous area. My first Karrimor MM 1970 started from Eskdale and last year the Lake District Mountain Trial started from here. 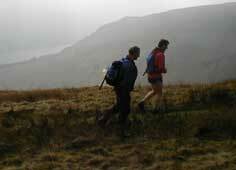 We find that having travelled to the Lakes many people are keen to get out and stretch their legs. 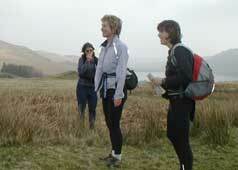 So we have a short orienteering course which should be a nice gentle intro to the area. For those who do not feel this need, we have lots of maps and kit for you to play with, or just sit, relax and drink tea with tutors and other course members. The hostel does carry a range of local beers, or the Woolpack Inn is only a few minutes walk away. 10.00 am. 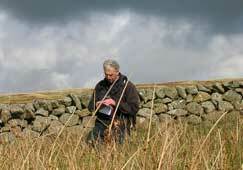 Map reading and Navigation skills Day, Hands on coaching and tuition with your tutor. 1 : 4 max ratio. 4.00 pm. Back to base. Tea and sticky buns etc. 5.00 pm. Seminar; Equipment, Clothing and Food. Q & A's. Put those skills into practice on your own or with your tutor. Night nav is designed to simulate bad visability / weather. OOps, even the best sometimes finish in the dark. Hopefully we should finish at the pub before it closes!!!! For a chat and a review of the day. 8.30 am Introduction to Competition Day. What to expect when you turn up to an event, registration, starts, etc. 9.30 am Score Event (5 hours) First start 9.30am. and every 3 mins after. You can start as a single or in pairs. 3.30 pm Closing review and Any Other Questions. Personal 1 to 1 ( or up to 4, bring a friend or 2) sessions are available by arrangement. We will do half days / evenings. Give us a ring or E-mail. Do you need a BCU Sea kayak 3* for the Heb Challenge ? or Hard skills for Adventure Races. "I've worked with them both for a long time in the free-lance Outdoor industry.They run their own company based out in West Cumbria so you can read more about them at www.carolclimb.co.uk. Carol and Ric are truly professional in all they do. Sometimes it seems Ric was doing KIMM's before I was born, and he has planned events too. What he doesn't know about the outdoors isn't worth knowing. 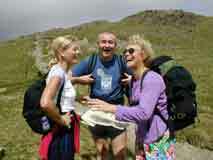 Carol proudly states that she enjoys a more leisurely pace to her outings but is a first rate all round mountaineer. Carol and Ric also teach and assess Mountain Leader Training Awards, amongst many other things and their teaching skills are first class."